Scholarship opportunity –Female senior students-South Bay area-March 15 deadline! The application is attached, and the deadline for receipt of all materials is March 15, 2017. In 13 days (March 11th), Reframe is hosting The $1,000 School Hack Challenge, a free daylong event in which Los Angeles students ages 13-18 team up to design and test their innovative ideas to improve their school, classroom, or community. Winning ideas get $1,000 for implementation, and they will be selecting 5-10 winners. The event will most likely be held at Mendez High School at 1414 Kemmett Ct, Los Angeles, CA 90033. Students attend as individuals. After pitching, the top 10 ideas will be identified via crowd-sourced voting and students participants will then self-form teams. A team of Da Vinci students could still work together under this process. Students don’t necessarily need their own ideas to participate, since they can simply join another team, but they do hope each student comes with his/her own idea for the initial pitch. Please let us know if you have any other questions and we will be happy to answer (or find the answer!) for you. Please join us for a parent educational workshop: Counseling Services provided and available to DVD/C families. What: Workshop for families: Counseling Services provided and available to DVD/C families and trends counselors are seeing in students. CASH for college is offering free workshops if you still need assistance. See the link for more information. 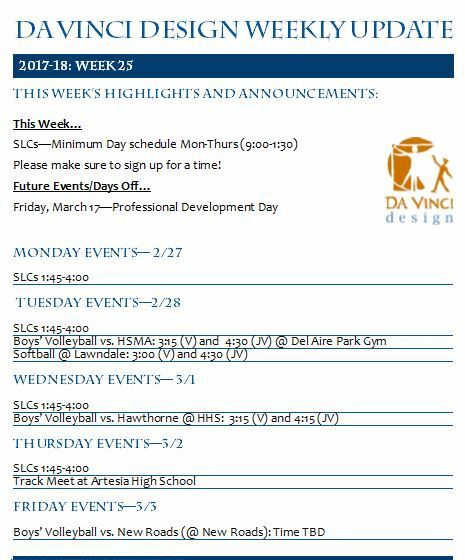 Designers, next week is SLC week! The school day runs from 9:00-1:30 and then Student Led Conferences will run from 1:45-4:00 Monday through Thursday. Friday is a regular schedule, running from 10:00-3:55. Teachers have provided materials in class as well as on their weebly sites. Please make sure you have signed up for an SLC spot! Da Vinci students – we encourage you to apply to this great opportunity. Girls Who Code Summer Immersion Program (SIP) is a free, 7 week summer program for current 10th and 11th grade girls to learn computer science. The application is due on March 17th and is fairly simple. Students don’t need any prior computer science experience. Here a flyer with more information. Would you like to interview prospective Da Vinci counselors? This Friday, 2/24, there are candidates coming in for both a morning and afternoon session. Please sign up at the link below if you would like to participate! Morning Session runs from 10:00am-12:00pm and the afternoon session runs from 1:30 pm-3:30 pm. We need at least 1 to 2 parents per session. If you can only make it for a portion of the session, it is still helpful. Please contact Kate Parsons, Principal, at kparsons@davincischools.org or 310-725-5800 if it is easier to RSVP using either of those methods. Da Vinci Design students – if you are looking for a volunteer opportunity, Aviation Little League needs your help! This Saturday, February 25th from 10:00 AM to 2:00 PM, you are invited to their Field Clean Up at Aviation Little League. Sign up at the “Sign Up Genius” link below if you would like to attend and earn some hours! The league fields are located North of Del Aire Park and behind some of the Da Vinci Schools (Design and Communications). The Opening Day of the baseball season is March 4th. Every year we have a large crowd for opening ceremony and we want the fields to look very presentable. Due to the past storms we have not been able to complete some of the field clean up. One major project will be painting a large size of wall that is located west of the fields. It is the wall that divides our fields to the aerospace parking lots. We have the paint and some materials (brushes/rolls). We understand your students need volunteer hours and we will like to invite your students to come down to the field to help us paint the wall and even possible draw a mural(s) on the wall. Please bring brushes and/or rolls if you have extras. It will be a big help for us. Make sure to get plenty of sleep and eat a balanced breakfast! Please be on look out for materials from grade level teams regarding sign-ups. These were given out to students last week. Seniors…DV Extenstion (DVX) Parent Info Session…TONIGHT! Come and listen to Kim Merritt (DVX Director) discuss all of the wonderful opportunities at DVX, the different pathways, application process, and much more!